Back in 1994 some babies were born in one of our litters of an unusual colour we had never seen before, kind of a porridge colour, paler than dove, but with dark eyes. The parents of this litter were rats that we had bought, and we were not familiar with their background. We decided to keep one of these babies, as we'd never seen anything like it before "Jaspur"(PicA2.1). As this little guy grew, his colour deepened and then appeared to take on a grey cast, eventually ending up an exquisite glittering pale grey colour. At around 4 weeks of age It became apparent to us that his eyes were a medium ruby colour, whereas at first we'd thought they were black. Well I got on the internet one night to search around the overseas rat sites to see if I could find anything like it.. I did find some photos that looked similar in colour, but could not ascertain from the pics whether the eyes were ruby or black, as in the photos they looked black. Eyecolour being a very big indication of major genes involved, and a big help to working out the colour. Lots of discussions about what colour these new rats could be then followed, with both breeders overseas as well as here and interstate. It turned out that interstate breeders had also seen a few of these type there too. (pic A2.2) It was offered by an overseas breeder that maybe these were powder blues. We got rather excited about this, as blue was a very sought after colour. Around about the same time, there were other much darker coloured rats beginning to appear that were taken at the time to be blues. (Pic A2.3) So we began to think that blue had indeed mutated here in Australia. However testmatings of these supposed blue rats, did not produce what we had hoped. Instead of blue agouti's (Pic A2.4) we got these ginger looking coloured agouti's (Pic A2.5). and instead of silvers, all we got were blacks or doves in the litters. It didn't take long for an overseas breeder to identify (via hair samples and photographs) the fact that our ginger rats were cinnamons. So in light of this, and the fact that they'd come from our so-called blues, it was realised that the rats we'd so hoped were blue, were not, but were instead minks. So now we were back in the dark about what our smokey coloured rats were. Many testmatings later, it was confirmed that the smoke rats were not related genetically to the newly identified mink rats. Again it was thought that these must be some type of blue. There was also a misleading trait with this colour, that they appeared to have ticking, or at least a much darker end to all the hairs in the coat. This led us off on a tangent, thinking they may even be an agouti variety, but the test matings so far had yet again put another 'theory' to rest. It's now been identified, that this ticking or two tone effect to the hairs, usually appears in litters of mixed breeding (colourwise). So is probably the result of polygenes. It wasn't until a long while later after many hairsamples had been analysed by various different breeders, lots of photo and info swaps, many more testmatings, and the methodic exclusion of almost all the known genes, as litter after litter didn't produce what we were looking for. It had been suggested that the r gene (or red-eye dilute gene) had to be a factor, because of their eyes being ruby in colour, and that maybe they were some type of diluted fawn. The non-agouti version of which is beige. (well it is overseas at least). So while it seems almost impossible that we didn't get a fawn amongst any of our testmate litters, I then set out to see if I could breed a fawn from these. Two litters later we had our first fawns. But far from being the simple solution this should have been, it merely opened up a whole new debate about colours. You see the fawn rats we were comparing these to, from overseas, were a lot lighter in colour and a shade or two paler, than the much darker babies we had just produced. So dark in comparison, were these babies, that it was suggested that they were bluefawns, because of their bluelike coloured ticking. But we knew this couldn't be right, because we didn't' have blues here. Which again raised questions about the smoke rats. Not too long after this we finally discovered that the smoke coloured rats were indeed the non agouti form of fawn. (Fawn being A-rr (Pic A2.6), smoke being aarr (Pic A2.7)). It was decided that the nickname smoke, while an accurate description for the colour, wasn't a very good choice, simply because there is a variety of rats overseas called smoked. 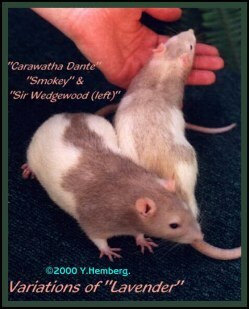 A gene causing the undercoat of the rat to be paler than the topcoat, similar to the smoke variety in cats. So for a while there we opted to call them beige, as they had been called overseas for many years. In 1999, as this colour became more popular, the question of why we called these rats beige, when their colour was nothing like beige arose. It was not hard to see that our beige rats, were not very much like the beige rats overseas, and that a different, more accurate name was called for. There were a few names tossed around, before the name lavender was settled upon. Thought of originally because the colour is so very much like that of a lavender oriental cat. After this decision, I scoured the net to see if there was already any genetically described colour with this name. The only reference I found to it was something back in the 1950's where Roy Robinson had come across some rats he'd called lavender. But it was noted that the colour was no longer in the fancy. So ANRA officially standardised this colour as lavender. Lavender rats show a fairly wide range of variation in the shade, depending on other colour influences in the line. There appears to be three shades. It appears that the lavenders, probably because it's one of the paler colours, is affected by the effects of polygenes and carried recessives in the line, a bit more noticeably than some of the darker colours. We believe this is the reason for the rather large variation in colour. At least so far, this is how it seems, who knows what we may find out about this colour in the future. I have my theories, as yet not proven, that the three shades may even be lavenders that are also recessive for another gene too, ie the darker shade could be aammrr, the palest shade may even be due to the presence of the albino gene (c) in the line, while one of these shades at least is undoubtedly straight aarr. 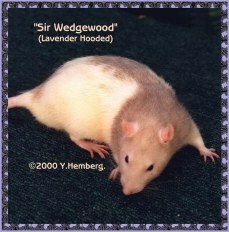 Below is a photo with two rats side by side, displaying the darkest shade next to the palest shade, then Sir Wedgewood, the med.shade in the left hand pic. Lavender is my favourite non-agouti colour in rats, while I'd have to say, that in the agouti varieties, even though we don't yet have them here, Blue agouti-called Opal, is a personal favourite.